Silage clamp design and installation to comply with the UK silage clamp regulations (SSAFO Regs (UK)) is an essential component of modern anaerobic digestion plants. 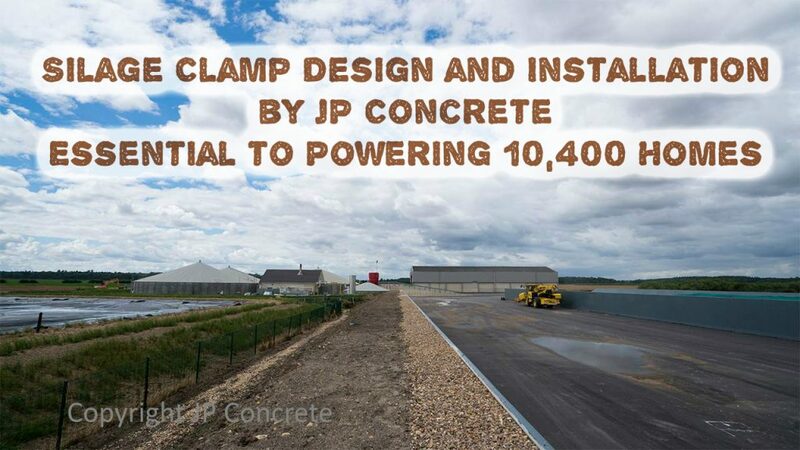 We are pleased to post the Press Release provided by JP Concrete below, and emphasise that such installations are essential to the provision of reliable 24/7 powering of 10,400 Homes, via the national grid. The humble silage clamp, so often forgotten when biogas production is discussed is the key to storing energy from annual harvests, so that the energy producing AD process can be fed a consistent feedstock. That very consistency of the food provided for the bacteria (also including archaea) which drive biogas production, is what ensures that power is available to those homes throughout the coldest days of winter, and hottest summer heatwaves. Designing and building silage clamps to the lowest possible budgets, which will provide a seal against loss of liquids into the environment is not an easy one to pull off either. During silage clamp design the regulations have to be complied with, and the seal has to be maintained over the years, so this news of seven such examples is indeed noteworthy! Watch our taster video about this page, which is located immediately below. BUT, we do hope you will scroll on down, after watching, and enjoy reading the full article. 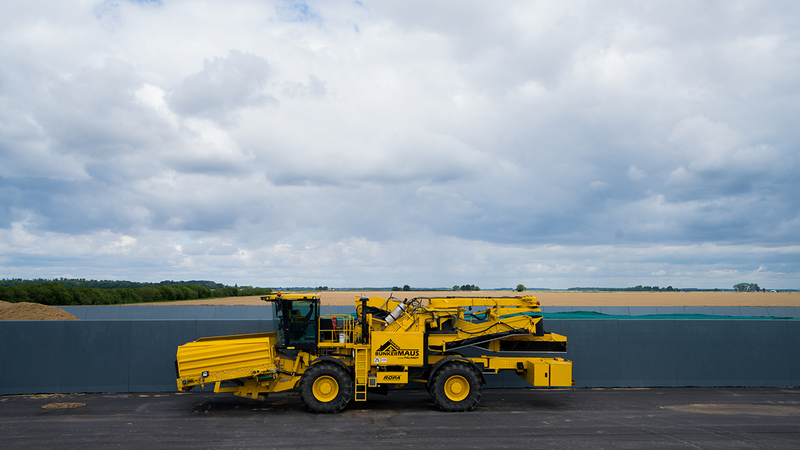 JP Concrete has completed a total of seven silage clamps and storage pads for Beeswax Dyson Farming’s AD plants in Lincolnshire that produce almost 5MW, powering 10,400 homes via the National Grid. The pre-cast retaining wall units from JP Concrete have been installed at the Nocton Fen and Carrington AD plants, as well as at five satellite pad locations in the local area. 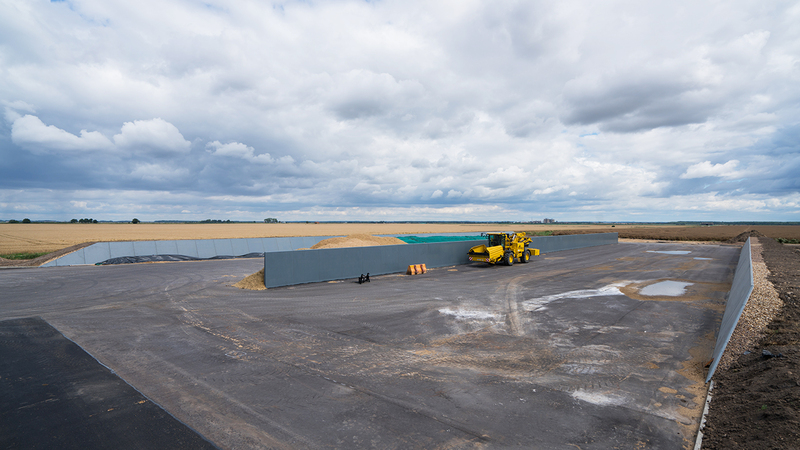 “Our new satellite pads allow us to use the crops we harvest as and when required – not just for our AD plants, but for general temporary storage. This greatly reduces vehicle journeys around the surrounding villages, meaning less impact during the busy harvest time. On energy crops alone, we harvest 2150 ha annually”. Beeswax Dyson Farming’s contractors installed the earth bank retaining walls, whilst Modular Cubed (JP Concrete’s sister company) utilised their own 73-tonne truck-mounted crane to install 3m high, 5.6T dividing T-wall sections. “The pre-cast products from JP Concrete, which are of excellent quality, were supplied and installed very quickly. 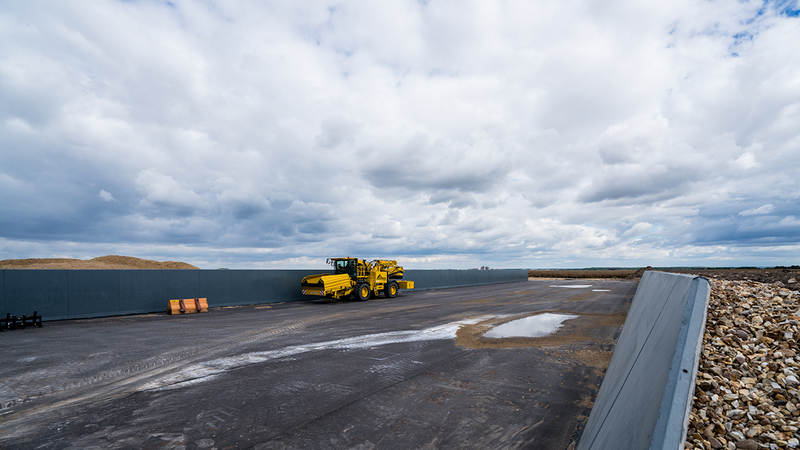 The decision was taken to use the existing earth banks on the outer walls of the clamp to provide a base to form new 3m high precast earth bank retaining walls. And because we would be storing a variety of crops, a central dividing wall was constructed using pre-cast modular T-walls, which has certainly improved the way me manage our AD feedstock”. From both Nocton Fen (Beeswax Dyson Farming’s first AD plant) and Carrington (commissioned in 2016), a very high quality digestate (applied to the land) has significantly increased the land’s fertility and organic matter. This complements the company’s sustainable crop rotation and diversity of cropping to enhance the health of the soil, reduce weeds and improve the utilisation of fixed costs. Phil Sayers from JP Concrete, commented: “We aim to provide the AD/agricultural industry with much more than just precast products, offering our experience with design, and via our sister company, Modular Cubed, a complete installation service”. He added: “Helping Beeswax Dyson Farming implement their sustainable and logistically sound approach to crops, land and renewable energy is work that we are extremely proud of”. Previously, JP Concrete created an all-encompassing storage and safety solution to ensure the smooth and efficient operation of a new AD plant in Reading for meat and vegetable producers Butlers Services. JP Concrete supplied concrete bund walling for three digestate tanks, a silage clamp and a retaining wall for site access. They also provided all silage clamp design calculations and drafting services, as well as carrying out the installation and sealing of the units. A Dorset farmer has been ordered to pay £16,339 in fines and costs for polluting a tributary of the River Divelish with slurry. The case was brought by the Environment Agency. The pollution was first discovered during a routine inspection of the river on September 20, 2012. Agency officers traced it to Lowbrook Farm, Belchawell near Blandford Forum run by dairy farmer Clifford Yeatman. We would be pleased to receive any comments you may have about your experience of silage clamp design, installation, and maintenance. Many people who own homes with air-conditioning fail to realise how much energy is used by these units. If you have an air-conditioned home, consider a greener way of cooling off by saving the energy used to cool the air. Try to save air-conditioning for the hottest days. Keep blinds and drapes drawn during the hottest hours and open windows and doors after the sun goes down. Ceiling fans can also help a great deal! 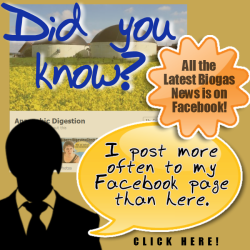 What is the materials used to start the biogas making process – human dung? This is best. Yes? Yes. Most people say any sort of dung, or manure. Dobry artykuł. Podobało mi się czytanie. pls make the silage clamp construction video step by step so that every one understand. Thankz. A word of warning about the safety of these silage clamps. It’s easy to be unaware that awful Silage Clamp accidents you would never imagine can occur. The url I gave tells of the death of Stephen McMinn entered the area below the silage cover and was overcome by a severe lack of oxygen and tragically died as a result. Other farm workers had laid tyres on top of the plastic sheeting layer to stop it blowing away.